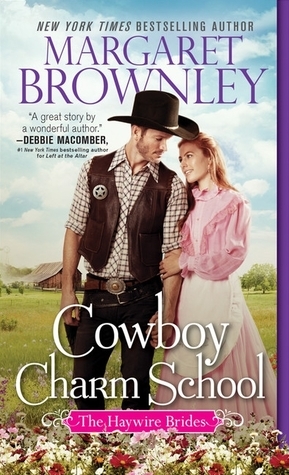 Sign into Goodreads to see if any of your friends have read Cowboy Charm School. Lovely review Julie! Coming from the UK! It still fascinates me to see books with cowboys on the cover! I’m glad you enjoyed it. JV ❄️☃️❄️ wrote: "Delighted to hear that this was a romantic and humorous read, dear Julie! Fab review! ❤️🥰"
Nicola wrote: "Lovely review Julie! Coming from the UK! It still fascinates me to see books with cowboys on the cover! I’m glad you enjoyed it. Jaline wrote: "Terrific review, Julie! So glad this was a refreshing read for you! :)"
*TUDOR^QUEEN* wrote: "Lovely review! 😀💗"
Great review, Julie. Love the title! Holly wrote: "Great review Julie!" Maureen wrote: "Another wonderful review Julie, happy you enjoyed it 💕"
Angela M wrote: "Great review, Julie. Love the title!" Shelby wrote: "Lovely review, Julie! This one sounds like an adventure 😊"
KAS wrote: "Oooohhhh, romance, humor and mystery!! Sounds like a winning combination, my friend. So glad you enjoyed, and excellent review ;) 💖🌼💖"
Jennifer ~ TarHeelReader wrote: "Terrific review, Julie! It sounds like this book really has it all! ♥️"
Mackenzie wrote: "Wonderful review, Julie! Sounds like a nice mix of genres :)"
Meredith B. wrote: "Great review, Julie!"